A gorgeous, top-drawer Twentieth Century Fox adventure spectacular, Captain from Castile (1947) – adapted from Samuel Shellabarger’s best-selling novel – offers Tyrone Power (The Eddy Duchin Story) as a Castilian caballero, first a victim of the Spanish Inquisition, then a member of the Mexican expedition of Hernán Cortez (Cesar Romero, Two on a Guillotine). 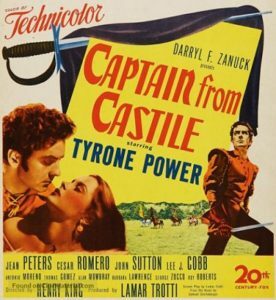 Along the way, he helps an Aztec slave (Jay Silverheels) and rescues a lively barmaid (Jean Peters, Broken Lance) from the depredations of a cruel Inquisitor (John Sutton). Directed by veteran Henry King (Love in a Many-Splendored Thing), and featuring a masterpiece of a score by the great Alfred Newman (The Keys of a Kingdom). As supplier Twilight Time prints up only 3,000 copies of each title, be sure to head over to the Twilight Time site or that of distributor Screen Archives NOW so you can get in your order!